Looking at the streets’ names in and around Sa Gerreria you can tell that it used to be the quarter of artisans and tradespeople. 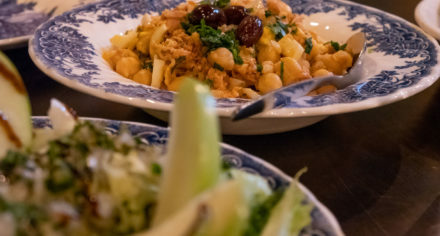 Following the setup of an Arab Suq, crafts werde concentrated in their own alleys named accordingly: Carrer Vidrieria, Carnisseria, Ferreria or Corderia -where the glaziers, butchers, blacksmiths or basket makers had their shops. Unfortunately, not much is left of this great variety – but you still find a few traces. 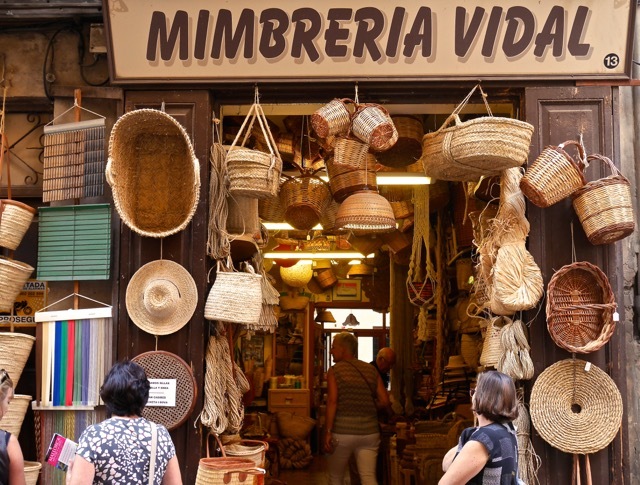 Like those of José Vidal and his son Tomas, who run one of the last traditional basket shops in Palma, Mimbreria Vidal. 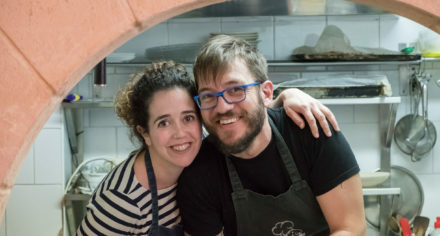 While Ca La Seu, the former basketry next door, is a lovely tapas and pintxos bar, today, the mimbreria has been a family business for decades, and José and Tomas proudly continue its tradition. Their narrow shop occupies the ground floor of an entire house with entrances to the streets on either side. 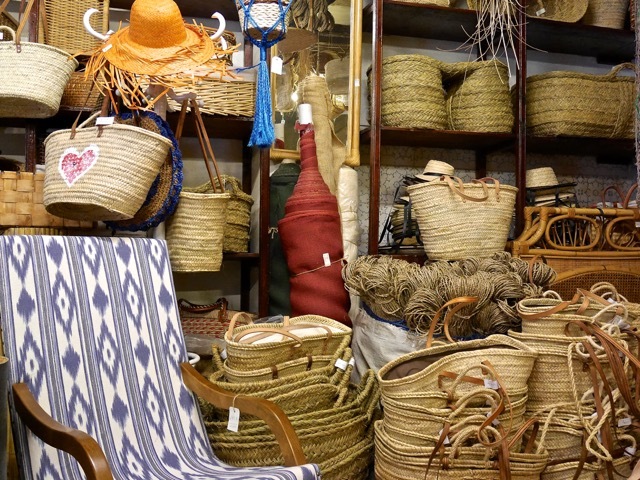 And if it comes to wickerwork, there is absolutely nothing you won’t find here: baskets in all sizes, colors and patterns, trunks, mats, hammocks, hats, and chairs, even folding and rocking chairs, bearing my favorite Llengos pattern. 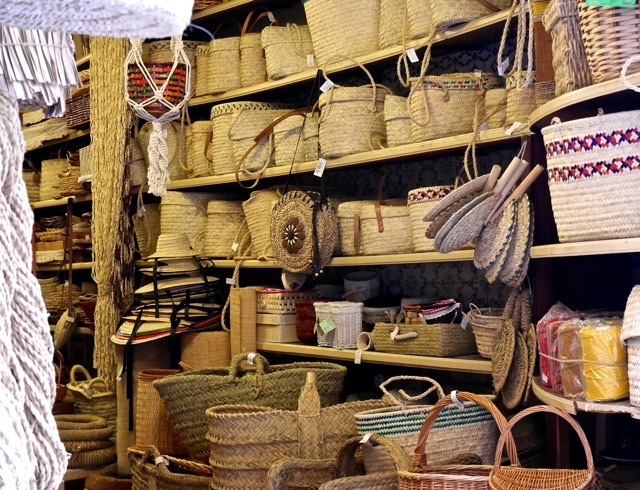 Locals and tourists alike stop by just to browse, or to ask for a specific piece of wicker. One of their most popular items is the senalla, the ubiquitous shoulder bag so convenient for beach as well as groceries. It’s made from the leaves of the Mediterranean fan palm, a wild domestic tree. 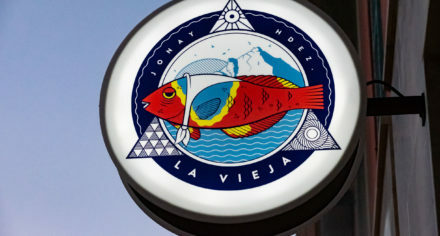 To my great surprise, Vidal’s senallas are all made on the island, the tradition of basket-weaving a true Mallorcan craft. It is kept alive by men, actually mostly women, who still master the now rare skill.